Considering moving your telephony system to the cloud? What is a hosted PBX and what are the advantages? Hosted PBX (Private Branch Exchange) is a telephony system that is hosted in a cloud environment, allowing you to remove the need for large capital expenses associated with onsite business telephone PBX equipment. A hosted PBX will allow you to take advantage of all the normal and advanced call handling features associated with the legacy digital based onsite PBX systems, usually being configurable via a user intuitive GUI by non-technical users, for configuration of your inbound and outbound calls. With this evolutionary technology being hosted and managed in the cloud, it provides SME and large organizations with a sophisticated telephone system accompanied with all the benefits of cloud technology like flexibility, ease of setup, mobility, and substantial reduction in costs due to reduced capital expenditure on hardware, lower maintenance and operational costs. With a hosted PBX platform, you would not require expensive maintenance contracts, internal telephony support members or expensive product licensing. Disaster recovery is also a massive benefit, with only an internet connection required to place and receive calls allowing you to relocate users in the state of a disaster. 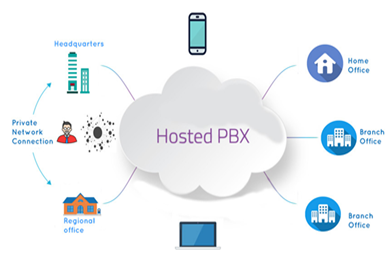 Additionally, a hosted PBX will allow you to support a remote workforce, as a result of only requiring an internet connection for calls to be placed and received but giving your clients the impression, every member of staff is operating out of a single office. You only pay for the services you need rather than allocating resources or rack spaces for future expansion, lines can be commissioned and decommissioned in minutes based on your business requirement. Hosted PBX systems will allow you to add as many new telephone numbers or devices as you require, customize your voice messages and service greetings, decide how you want your calls to be directed within your company without worrying about additional infrastructure or technical know-how as everything is maintained and provisioned by the service provider. The ease of connectivity and configuration will allow you to order local and international numbers without physically having offices inside the international destinations, broadening your customer reach. Employees that work from home can now make or receive outbound calls using their company assigned numbers. All they need is an internet connection to connect their physical IP handset or software base phones running on their mobile smartphones or PC’s. As organizations expand globally with different branches in various cities, the need for a simple but scalable centrally managed system that enables you manage all your voice telephony services on a single platform increases significantly. Virtual systems can easily scale to meet your burgeoning business needs. You no longer need to schedule appointments with a technician to add a new line, or connect a new branch office. With a Hosted PBX, you can manage all your billing and call flow designs in one platform ensuring uniformity of standards and quality consistency throughout your organization. These obvious advantages of a Hosted PBX have increased its popularity and adoption rates among many businesses today. The technology is not only here to stay but represents the future with legacy based digital ISDN services being marked for end of life. Here at VoIPLine Telecom, your Hosted PBX is implemented on a plug and play, easy to use user intuitive web-based portal as shown below. The setup process is rapid. Everything could be up and running in a matter of minutes. Many advanced features are available at your fingertips through the user friendly and intuitive graphical user interface, providing you with various tools you can use such as an interactive voice menu, call recording, call queues, call parking, voicemail to email, call queue, custom announcements and much more. You can access your VoIPLine hosted PBX from anywhere in the world (geographical flexibility), which makes working from a remote site easily feasible. Also, numbers from virtually any region in the world can be purchased and used as a Caller ID (a number shown to a person you dial). With a VoIPLine hosted PBX web-based portal, you have the ability to update, monitor and make changes to the system on the go. 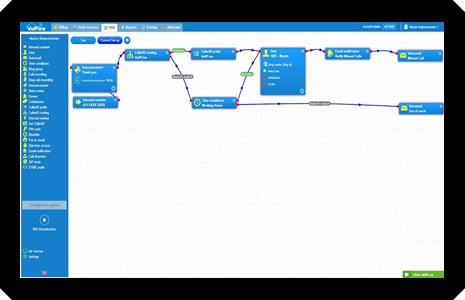 Both major updates and minor configuration changes can be completed without any advanced telephony experience or even general computer knowledge. For example, the ability to provision a new line for a new employee is less than a 5 minutes process or diverting calls to an external number or group of numbers when you are not available to pick the call, can be completed in less than 2 minutes. The cost saving associated with a hosted PBX platform doesn’t just extend to replacing the need for expensive on-site PBX equipment, but also runs into the ability to add flexible pricing for outbound calling. Call charges can customize based on your business requirements, and individual call volumes of your staff members. As the call usage increases or decreases for your staff members, a Hosted PBX platform will allow you the ability to upgrade and downgrade where applicable to lower your running costs. 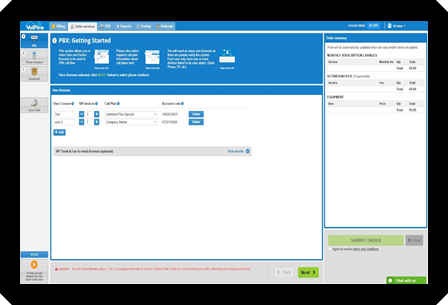 The image shown below is an example of the type of web-based portal available to manage the ordering and changes of services from a hosted PBX system. A few clicks is all that is required to place the orders and configure your services, eliminating the issues previously faced with onsite PBX’s that would require third party involvement from a line provider and maintenance provider. So, to summarize moving into the future and selecting a cloud hosted PBX system will not only save your business vast capital, but will allow you to be in full control of your telephone system, whilst also increasing the flexibility of the running of your business. 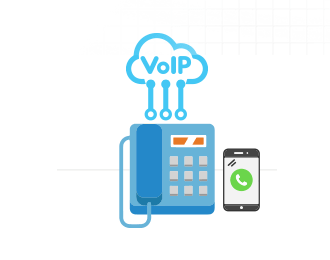 If you would like to see how a cloud-based hosted PBX works, feel free to sign up to VoIPLine’s 14-day no obligations free trial and experience the future in telecommunications.